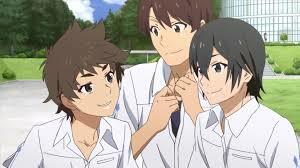 3 stars of slightly confusing time travelling romance anime. Fireworks (also known as Fireworks: Should We See Them From the Side or the Bottom?) 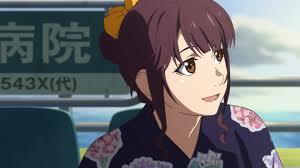 is based on the 1993 Japanese live-action television play of the same name, written by Shunji Iwai. This anime version is produced by Shaft (Nisekoi, Maria Holic) and directed by Akiyuki Shinbo (March Comes In Like A Lion) and Nobuyuki Takeuchi (Spirited Away), but features little of their style. It is released courtesy of Anime Ltd. and is presented here with both the English dub and the original Japanese track with English subtitles, in Collector’s packaging. While a classroom argument rages about how fireworks look from different angles as they burst forth in the night sky, the reserved Norimichi and his best friend Yusuke are about to compete for an even more explosive event in their young lives – the opportunity to spend some time with a girl named Nazuna with whom they are both smitten. The lucky winner is to be decided by a simple swimming contest, but the effects of this race are far more seismic than Norimichi could have imagined. When a mysterious glowing ball offers Norimichi a second chance at victory, he comes to learn that even the slightest changes in perspective can make a striking difference to the world around him – a daunting fact that might also be the key to helping Nazuna resolve the troubles which plague her. Fireworks is an unusual film which blends a few different genre with some success. I was genuinely surprised when the first sci-fi elements come into play. It has many positives, the story is enjoyable, if a little cliched and the soundtrack is fantastic, with sweeping piano music and expressive themes. 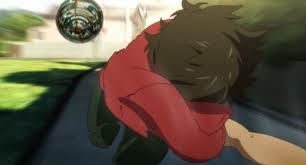 I also enjoyed the animation and C.G.I., however some of the scenes feel as if they were put there simply as a platform for showing off some new techniques, which makes the story a little disjointed in places. Overall, it’s a fun film to watch, the fireworks are spectacular and now I have no idea whether or not they are flat or round! 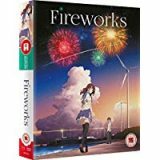 Fireworks is available to buy now on Collector’s Combi (Blu-ray and DVD).